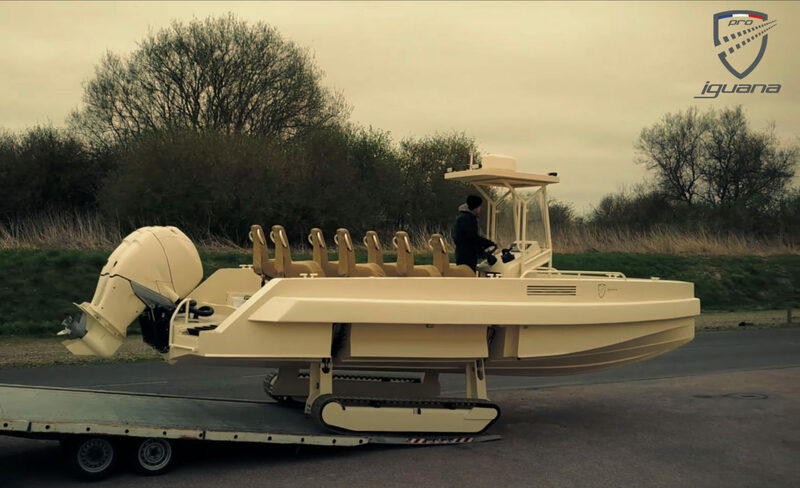 The Iguana Pro is a tough and intrepid boat with the capability to move seamlessly on to land, allowing freedom to access any terrain along the coastline without compromising its water performance. Sailing qualities: the deep-V carbon fiber hull combined with shock mitigation construction allows operation safely in strong weather and breaking seas providing the stability and maneuverability to operate effectively in a hostile maritime environment. Ground capabilities: the continuous track landing gear is able to conquer many types of terrain from sand to mud and gravels. The continuous band of treads driven by a series of wheels provide access where standard vehicles cannot. The Iguana Pro boat features Ullman Patrol Jockey Seats for operator and crew. Do not miss Iguana Pro at Bahrain International Defence Exhibition and Conference, BIDEC 16-18 October.